Simpson Strong-Tie DIABST50-SDS Drop-In Anchor SDS+ Power Setting Tool for 1/2"
Simpson Strong-Tie DIABST25-SDS Drop-In Anchor SDS+ Power Setting Tool for 1/4"
The Wej-It PD58 POWER-Drop internally threaded drop-in anchor includes a wedge mechanism to create a secure hold within solid masonry and solid uncracked concrete, and meets 2000 International Building Code and 2000 International Residential Code specifications. The anchor body and wedge clip are made of corrosion-resistant zinc-plated carbon steel. The wedge clip expands within the drilled hole to secure the anchor in place. A safety shoulder above the clip provides support when the anchor is under severe strain. When installed, the anchor does not protrude from the drilled hole, enabling flush anchoring of an object to the mounting surface. The anchor's allowable values may be increased 33.3% for short-term loading in resisting earthquake or wind loads. 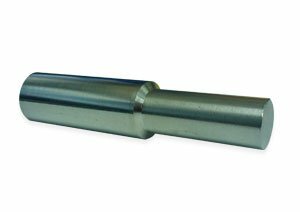 The included setting tool is externally threaded and has a washer and nut that can be placed to achieve a desired anchor depth. Once the setting tool has been threaded into the anchor and the anchor has been placed into the drilled hole, a hammer or mallet (sold separately) is used to drive the setting tool downward until the nut contacts the mounting surface. Tightening the nut sets the anchor and releases the setting tool from the anchor. 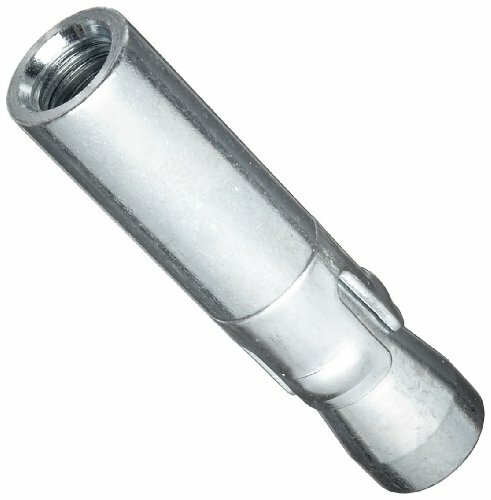 An item can be mounted by inserting a threaded fastener (sold separately) through it and into the anchor. Specifications Anchor Drill Diameter Min. Hole Depth Min. Embedment Depth Recommended Installation Torque, ft.-lb. Installation Turns Ultimate Tensile Strength in 4,000-psi Concrete Ultimate Shear Strength in 4,000-psi Concrete PD38 1/2" 3" 2-5/8" 25 2-1/2 6,409 lb. 4,200 lb. 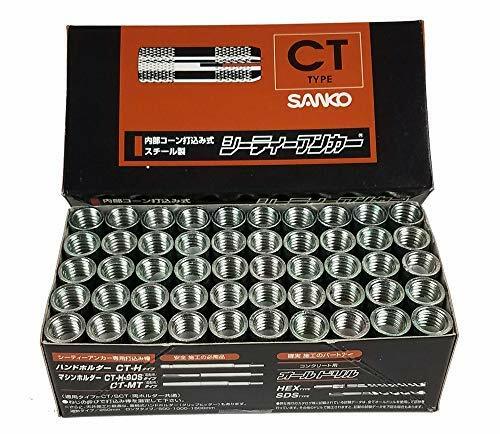 PD12 5/8" 4" 3-15/32" 55 2-1/2 10,352 lb. 7,340 lb. PD58 7/8" 5" 4-5/16" 90 3 16,500 lb. 11,880 lb. PD34 1" 5-3/4" 5-1/4" 175 4 21,409 lb. 13,360 lb. PD1 1-1/4" 6-1/2" 5-3/4" 290 3 24,752 lb. 26,440 lb. Warning: Use one-fourth or less of listed maximum values for safe working loads (as required by local regulations). For more information, see the specifications sheet. Anchors provide reinforcement to fasteners installed in materials that are considered brittle or have insufficient hold such as drywall, concrete, brick, and stone. Anchors provide support through methods such as expansion from within or behind the substrate, or insertion of adhesive compounds into drilled holes. Wej-It Fastening Systems manufactures mechanical and adhesive fasteners for use in concrete and drywall. The company, founded more than 60 years ago, is headquartered in Norwalk, CT. The Wej-It ST14 setting tool assists in the secure installation of Wej-It drop-in anchors (sold separately). 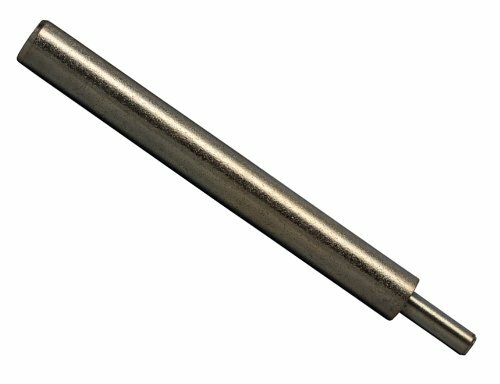 After the anchor has been inserted into the drilled hole, the smaller diameter of the setting tool inserts into the anchor and the back end of the tool is struck with a hammer (sold separately), expanding the anchor within the hole. Compatible Drop-In Anchors Wej-It ST Setting Tool Compatible Wej-It Drop-In Anchors ST12 WD12, WDL12, WDS12, WDSS12, WDU12 ST14 WD14, WDL14, WDS14, WDSS14 ST34 WD34, WDS34, WDSS34 ST38 WD38, WDL38, WDS38, WDSS38, WDU38 ST58 WD58, WDS58, WDSS58 Wej-It Fastening Systems manufactures mechanical and adhesive fasteners for use in concrete and drywall. The company, founded more than 60 years ago, is headquartered in Norwalk, CT. The Wej-It ST38 setting tool assists in the secure installation of Wej-It drop-in anchors (sold separately). After the anchor has been inserted into the drilled hole, the smaller diameter of the setting tool inserts into the anchor and the back end of the tool is struck with a hammer (sold separately), expanding the anchor within the hole. Simpson Strong-Tie DIABST25 Drop-In Anchor Hand Setting Tool for 1/4"
Simpson Strong-Tie DIABST25 Drop-In Anchor Hand Setting Tool for 1/4". This item is NOT a pack. but a SINGLE drop-in anchor tool WARNING: This product can expose you to chemicals which is [are] known to the State of California to cause cancer and birth defects or other reproductive harm. For more information go to www.P65Warnings.ca.gov.